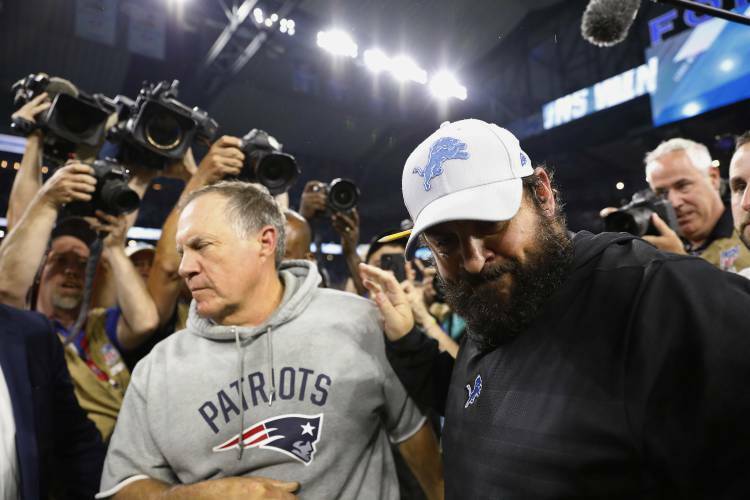 Reunited and it feels so good…Former Bill Belichick assistant coach Matt Patricia lead his new team, the Detroit Lions, over the New England Patriots Sunday night. The teacher was not happy but still hugged it out with his former student. Welcome back Carson. Philadelphia Eagles QB Carson Wentz (the Prince Harry lookalike) returned after blowing out his knee last season. The Eagles won the Super Bowl without Wentz in February but Philly fans were ecstatic to get their leader back (no Meghan Markle, of course). The Eagles edged the Indianapolis Colts Sunday. Historic… In the biggest NFL upset in 23 years, the Buffalo Bills shocked the Minnesota Vikings 27-6 in Minneapolis. TINK Sports is trying to confirm the rumor that the Anchor Bar sold out of wings and beer Sunday night. 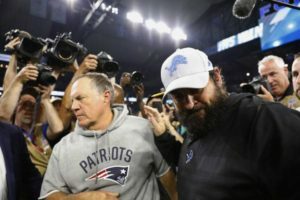 No comeback yet…The week ended with the Pittsburgh Steelers, still playing without holdout RB Le’Veon Bell, beat the Tampa Bay Buccaneers on Monday night. Bucs QB Ryan Fitzpatrick, continued spreading “Fitzmagic” with an NFL record third straight 400-yard game, but fell short 30-27. 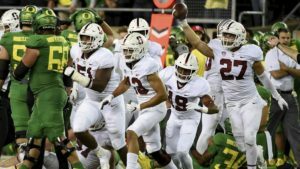 The most impressive comeback of the season thus far came in college football’s game of the week in Eugene, Oregon Saturday night. 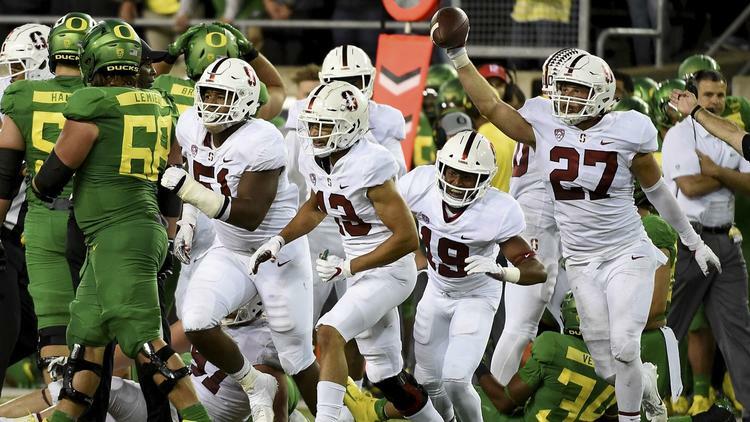 After trailing 24-7 at halftime Stanford regrouped and won 38-31 in overtime. Don’t call it a comeback…Ok it’s a comeback. Tiger is back, and golf is in the spotlight again. Tiger Woods, one of the most popular athletes on the planet, won the PGA TOUR Championship, his first victory since 2013. Where have you been? Recall that Tiger had his well-publicized personal scandals as well as four back surgeries and couldn’t even tie his shoes earlier this year. 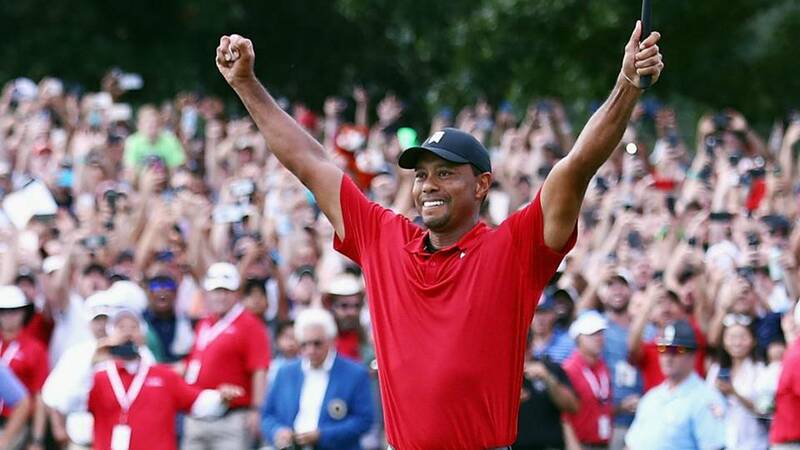 The victory is Tiger’s 80th all time, which leaves him just two behind Sam Snead for the all-time PGA wins record. Golf fans will be tuned into the Ryder Cup, the biennial tournament between the best European and American golfers, being held in France, Friday to Sunday. With one week left in the regular season, most of the baseball playoffs are set. The National League on the other hand is still up for grabs. Only the Atlanta Braves have clinched a playoff berth. The Chicago Cubs and Milwaukee Brewers are battling in the Central while the Los Angeles Dodgers and Colorado Rockies are neck and neck in the West. The MLB playoffs start Tuesday, October 2 with the NL wildcard matchup. Share the TINK Sports love. Remember at TINK Sports we watch the games so you don’t have to.